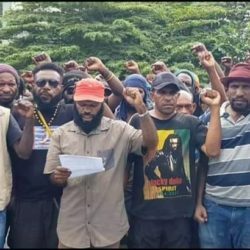 This statement has been released by West Papuan Independence Leader Benny Wenda about the Global Flag Raising which will take place on 1st December on West Papua National Day to raise awareness and support for the people of West Papua and their freedom struggle. 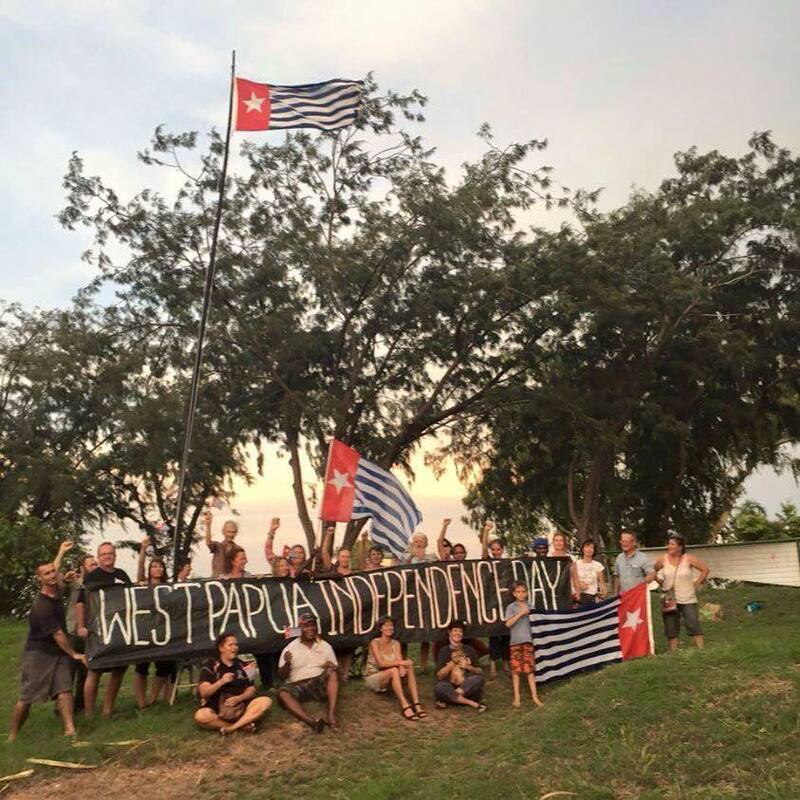 I am writing this statement to let you all know that on 1st December 2016, the West Papuan flag will be raised all around the world in solidarity with the West Papuan freedom struggle. 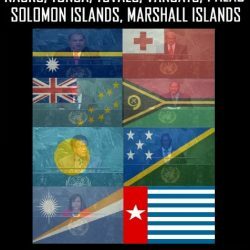 The Free West Papua Campaign is calling on all international supporters to please join this Global Flag Raising and show your support for peace and freedom in West Papua. 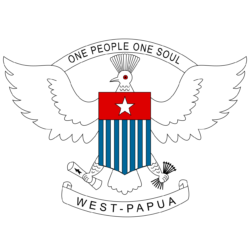 1st December 2015 marks exactly 55 years to the day that the West Papuan flag was first raised; with full Independence for West Papua due in exactly 9 years’ time. 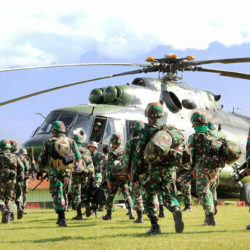 However within months our dreams were crushed as Indonesia invaded West Papua. 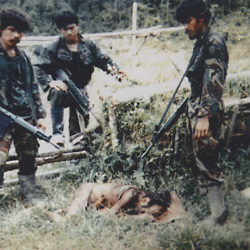 For over 50 years, we West Papuans have been suffering under a secret genocide and the illegal Indonesian occupation of our country. 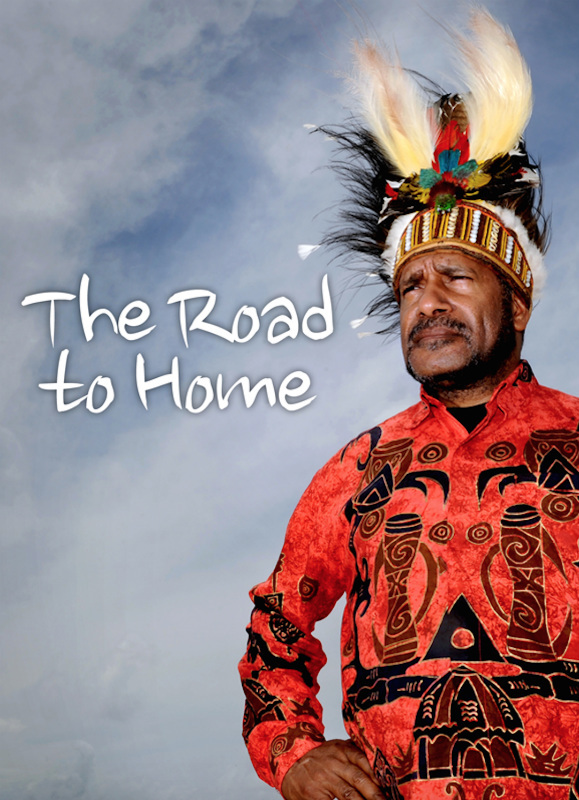 Over half a million innocent West Papuan people (almost a third of the population) have already been killed. The symbol of my people’s resistance against Indonesia’s oppression is our national flag, which we call the Morning Star. Our national identity is so suppressed under Indonesian colonial rule that our national flag has been outlawed and now West Papuans like former political prisoner Filep Karma are jailed for 15 years just for raising it. 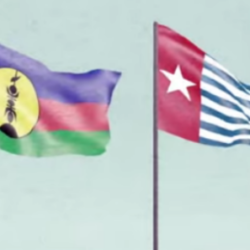 However, while we West Papuans cannot raise the Morning Star, you in the international community all have the freedom to raise the West Papuan flag to show your support for West Papua’s freedom. 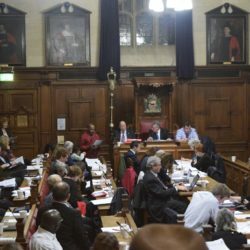 This year we have achieved huge political progress with regional and international recognition of our West Papua’s rights. 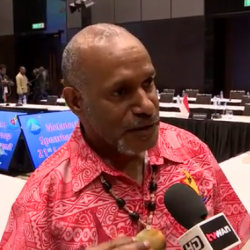 In face seven Pacific nations stood up at the United Nations to supports the rights of the West Papuan people, the first time in over 40 years. 1st December this year is therefore a time for the Free West Papua Campaign to celebrate our successes but also to get together and make plan more actions. 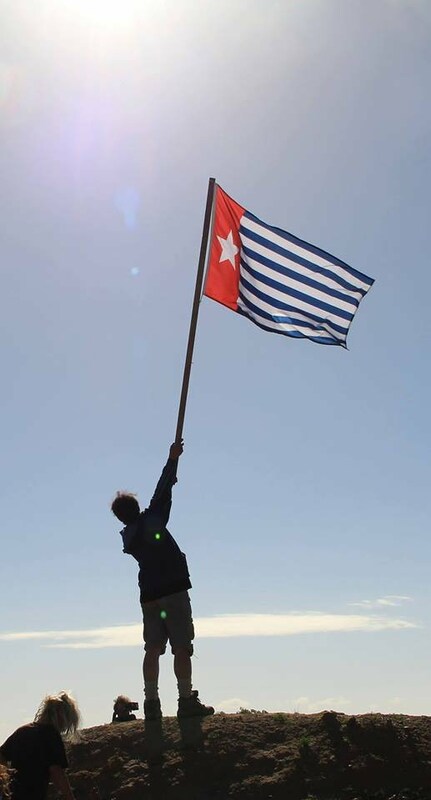 I hope that this year more people from around the world the will join this Global Flag Raising for a Free West Papua. We need support from the Pacific, Africa, North America, South America, the Caribbean, Europe, the Middle East, Asia; right across the world. Therefore on behalf of my people I invite you all to join this international flag raising. 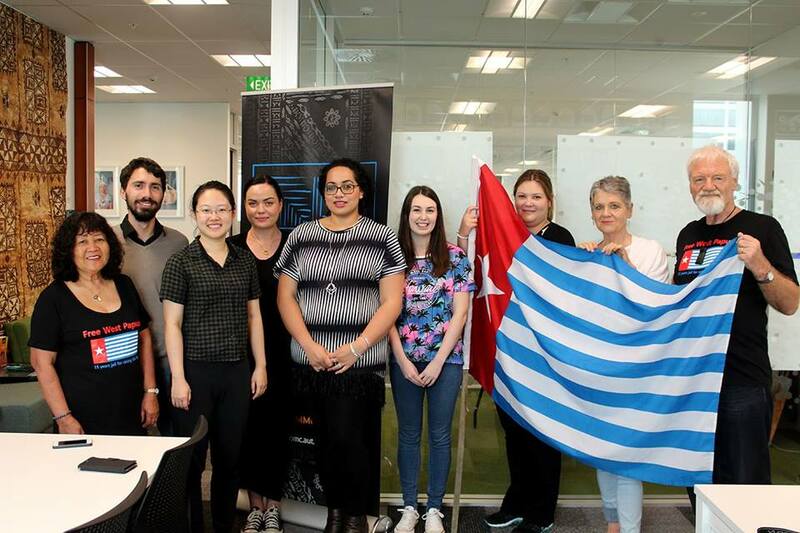 Last year’s Global Flag Raising helped a lot to raise the West Papuan struggle in the public eye and so I hope this year more people will join the movement for a Free West Papua. On behalf of my people I invite you to join what is expected to be the biggest global flag raising yet for West Papua. In 2014, the Free West Papua Campaign received over 100 photos and in 2015 over 200 photos from over 30 countries worldwide! This year we hope to get it to over 400 photos in over 60 countries and we need your help to do so! As I am sure you can imagine, it means so much to my people to see our flag raised around the world. 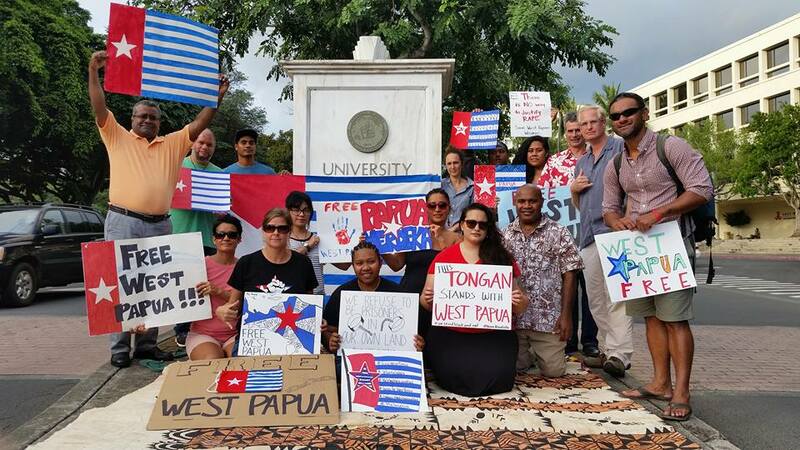 It gives us so much hope; inspires so many others to become part of this global movement and it regularly encourages more and more people internationally to form and support Free West Papua solidarity groups. 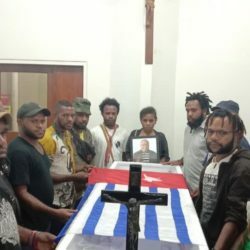 Please do send any photos of your flag raisings to the Free West Papua Campaign Facebook Page, Twitter or via e-mail [email protected] and they will be posted on these sites to show the world your solidarity. On behalf of my people I would like to thank you all very much for taking part in the Global Flag raising. We feel that you are the voices of the voiceless and we are so grateful for all your true compassion and solidarity for West Papua. The Morning Star will rise around the world for a Free West Papua! 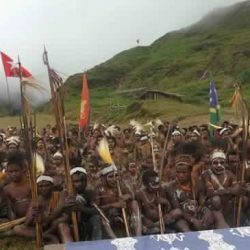 Solidarity with Standing Rock on West Papuan Independence DayURGENT REPORTS: At least 9 West Papuan people shot, 1 killed by Indonesian police. My people are in danger.